Teton Toyota/Scion will be celebrating its 10th anniversary this weekend, and to say the past 10 years have not been an adventure would be a gross understatement. Pocatello native Mario Hernandez came to Idaho Falls in 2005 to take over Rocky Mountain Toyota when it was still on East Anderson Street. At the time, Sunnyside Road had not been expanded westward to link with Interstate 15, and the Snake River Landing development was in its birthing stages. Hernandez and his crew led the land rush to the south, planning a new dealership on the north side of Sunnyside. It opened there about the same time the economy went into recession, but at least publicly Hernandez never questioned the wisdom of the move. Ten years later, Teton Toyota has been joined by Teton Volkswagen in Idaho Falls and Teton Honda and Teton Hyundai are coming to Pocatello. In its ten years, the company has proved itself a good corporate citizen, supporting events like the Great Race for Education. Hernandez and his wife, Glenda, are involved with The Idaho Falls Arts Council, the Idaho Falls Symphony, the Snake River Animal Shelter, School Districts 91 and 93, the Holy Rosary School, the Rocky Mountain Elk Foundation, and Ducks Unlimited. The celebration begins today at 11 a.m. Lunch will be served today and tomorrow from 11 a.m. to 1 p.m. Anniversary pricing will be available all weekend. And of course Buddy, Hernandez’s black lab, will be on hand to greet guests. 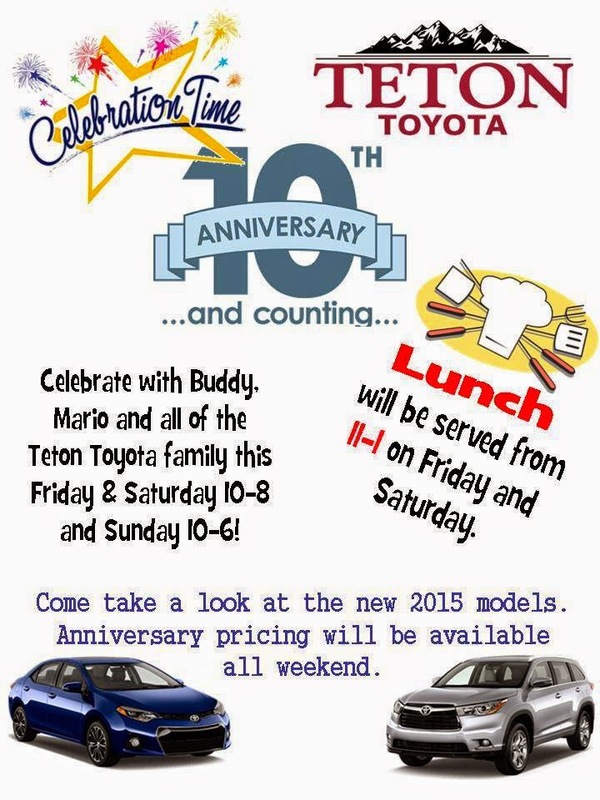 Teton Toyota does so much for the community. I'm particularly impressed by its corporate giving to several worthy causes. They've been a strong supporter of education, the new animal shelter, the Arts and much more. Teton Toyota's philanthropic spirit has certainly influenced my loyalty to its organization.